Hoe te overleven op zee? 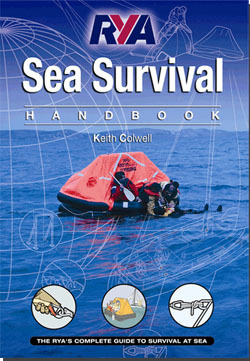 The RYA Sea Survival Handbook is designed to complement both the RYA Sea Survival Course and the ISAF Offshore Course. This book is ideal and essential for anyone taking to the seas, whether on a motor or sailing vessel, and gives in-depth advice and information on safety at sea. It will teach you all you need to know about preparing to go to sea, emergency procedures, safety equipment, life-saving signals, handling heavy weather and choosing the most suitable life jacket or buoyancy aid. Providing the most up to date information on all the above items, this book is written by Keith Colwell, (RNLI Divisional sea safety officer) and is impeccably illustrated by Steve Lucas. This comprehensive and well illustrated guide takes you step by step through all aspects of sea safety, from kitting your boat out, right through to correct procedures for abandoning ship. The text is enlivened by a number of fascinating real life examples of boaters dealing with emergency situations.